A dwarf planet is shining two bright lights at a NASA spacecraft right now, and our smartest scientists are unsure what they are. As bizarre as that sentence sounds, that’s the situation with Ceres — the largest object in the asteroid belt between Mars and Jupiter, officially designated as a dwarf planet (the same category as Pluto). NASA’s Dawn spacecraft is approaching Ceres ahead of a March 6 rendezvous. The picture above was taken February 19, from a distance of just under 29,000 miles, and shows two very shiny areas on the same basin on Ceres’ surface. Previous Dawn images from further away showed a single light on Ceres, which was just as mysterious. Then, to the amazement of every astronomy geek, the one light turned out to be two — reflecting roughly 40% of the light hitting them. 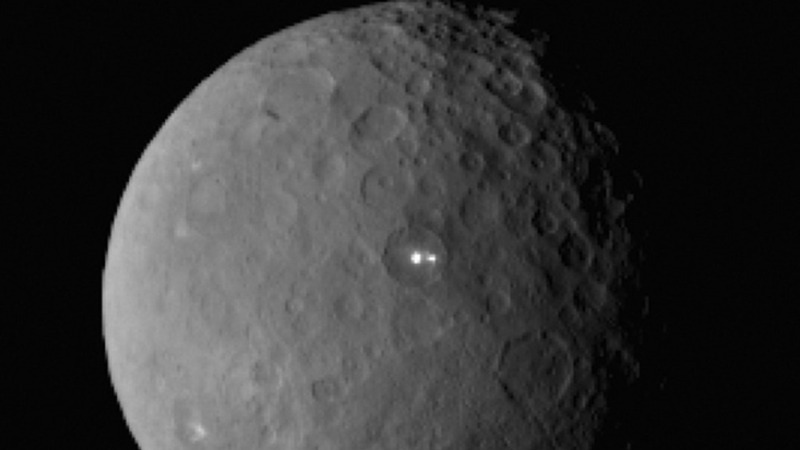 The lights on Ceres in earlier photos from the Dawn spacecraft. So what could the bright spots be, other than alien castaways signaling at us with flashlights? The most obvious contender is ice, although ice would reflect more than 40% of all light hitting it. The difference may be accounted for by the resolution limit of Dawn’s camera at this distance. Scientists have previously detected water vapor coming from the surface of the dwarf planet, making ice — a more likely option. Scientists have also suggested the bright areas could be patches of salt. On the other hand, the location of the two bright spots so close together may be an indication that they have a geologic origin, such as some sort of volcanic process, possibly even ice volcanoes. According to Chris Russell, principal investigator for the Dawn mission, the positioning of the bright spots within the same area may indicate “a volcano-like origin of the spots,” but scientists will have to wait for higher resolution images before making such interpretations. Scientists don’t think the spots comprise lava similar to that seen on Earth, since that would shine more brightly.